We have quite a good number of hard-to-get items issued by the North Korean government since their establishment as a nation. They have been long-time targets of pursuit by (North) Korean riff-raff who have given up only a few, if any, materials for their study. In the past decade, however, a Korean-American dealer who claims to have a good connection in North Korea successfully smuggled (?) out some items, apparently archival materials, into the western market, including phantom stamps, such as the 20-jon Hibiscus, green version of 1946; the 1-won Owners of Land, red print of 1947; and so on. He also brought out many rare items, such as the Labour Law stamp of 1948; the mint 3rd. Anniversary of Liberation of 1948, and so on, and put them into the market. Many readers are well aware of these and might join the scramble for them as he offered them in internet auctions, and his successful transactions stimulated others who also offered NK rarities through some of the same outlets. 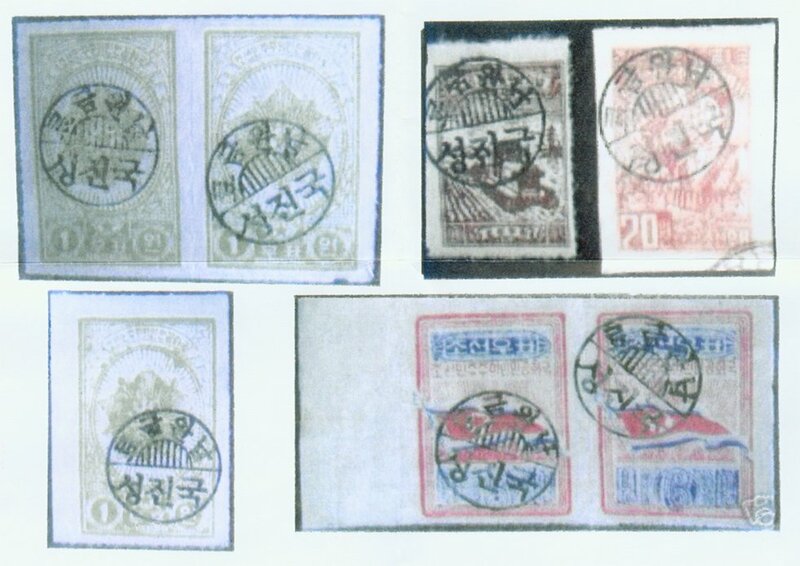 Among these rarities are the early overprints of North Korea. 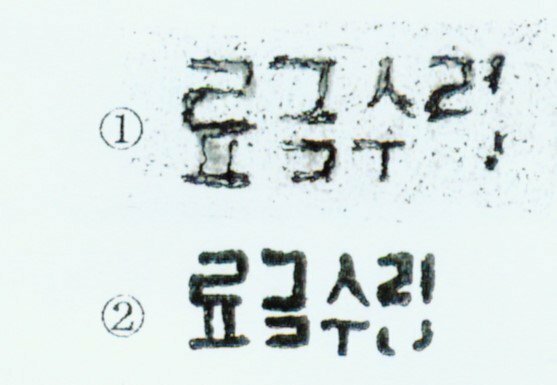 As background, we have to remember that, at the time of these overprints, everything was in severe disorder everywhere in N.K. Further, the reason for these overprints being planned and produced was that there were very limited supplies of materials and ingredients at hand. For surcharge overprints, stamps used were high values with useless denomination, such as 6 won. For validation overprints, the stamps consumed were those that were commonly available, such as 1 won or 2 won. Today, we have so many of these overprinted stamps appearing on internet auctions, but I personally am dubious about their authenticity. To verify my doubt, although I do not handle the computer well myself, I urged fellow collectors to make records of what they saw on the screen. To make a long story short, I will illustrate a few examples of these over-prints. The main purpose of this article is to caution you to be alert, as there is no record of origin or source of each sample and their size is flexible. 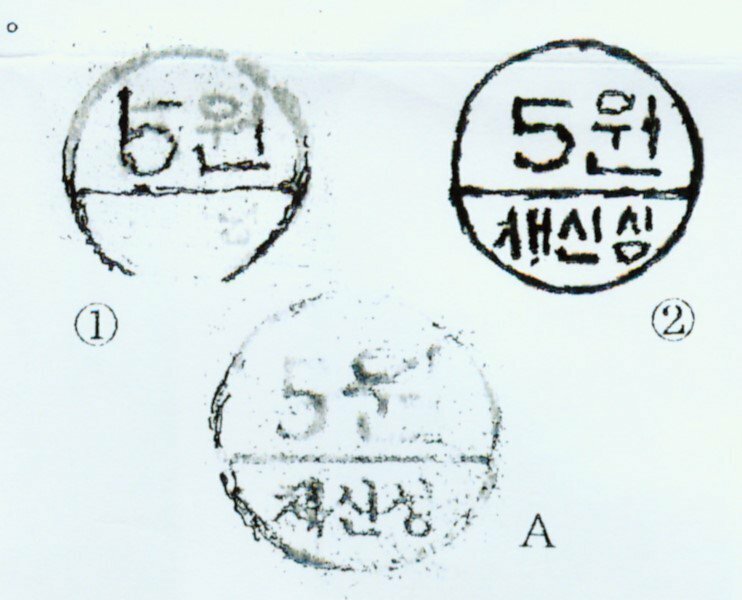 Group A is the 5 won surcharging the 6 won National Flag stamps; while group B is the same surcharge but showing no amended face value but “fee collected.” Group C is the validation overprints applied on various stamps but amending no face value. See next page for sample over-prints. Basically, it is widely known that the original chop looks like (1) with a diameter of 9.5-10 mm. and a local variety (Kaesong, they say) (2) exists with a diameter of 11 mm. For convenient comparison’s sake, the chop we are seeing is given as a Figure A which has a diameter of 14.5 mm. An example, believed genuine, is in figure (1), and figure (2) is a blow-up from S. Gibbons, while that found on the screen is figure A. It is obvious that both (1) and (2) comprise 4 letters, each all of which are slender, while figure A comprises 4 letters that are square and stocky. 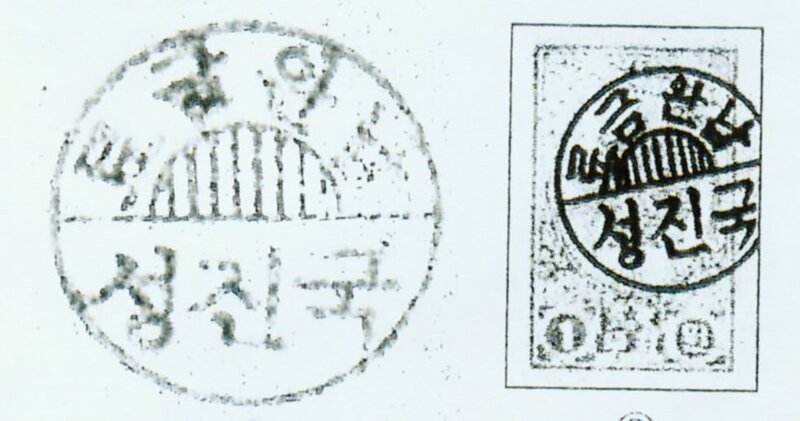 This is not a surcharge but a “validation” overprint first introduced in the Korean Stamp Catalogue (1946-1998), issued in Pyongyang, as #17-A. Later, in their newer editions, they maintain the record and explanation but without an individual number. Note that this type of validation was done in major local post offices where they independently prepared the chops and applied them ad libitum. Therefore, the types and descriptions are quite rich in formats. The present examples, regardless of the numbers that are appearing, seem entirely and perfectly made by a single chop. This seems very strange to me. More than strange is the fact that, while I have dug up a good number of examples overprinted by various major local post offices, showing their names in varying formats, the post office name appearing in these recently emerging overprints is invariably Son-Jin, which was introduced and illustrated in N.K.’s own catalogue about a decade back for the first time. For your reference, the illustration in the catalogue is displayed next to the figure we are talking about above. In addition to these above, I personally wonder if applying those overprints over high denominated stamps is regular or necessary? This is especially so with Group B, 40 won, Order of Soldier’s Honour. 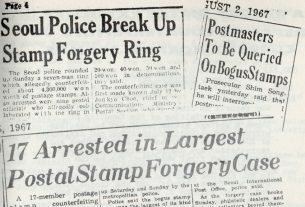 This is the case where a post office clerk needed to make a 6 won stamp. The face value was cut by 34 won. If done by the government, this seems to be too much, don’t you think? As floods of N.K. rarities continue in future years, my purpose here is to point to some clear differences that, with your assistance, can grow into a definite conclusion someday. Your comments, information, and interpretations will certainly be valued. As a separate story from the above, and for additional information, I record here very strange cases of other overprints by the N.K. government. In the 2007 N.K. 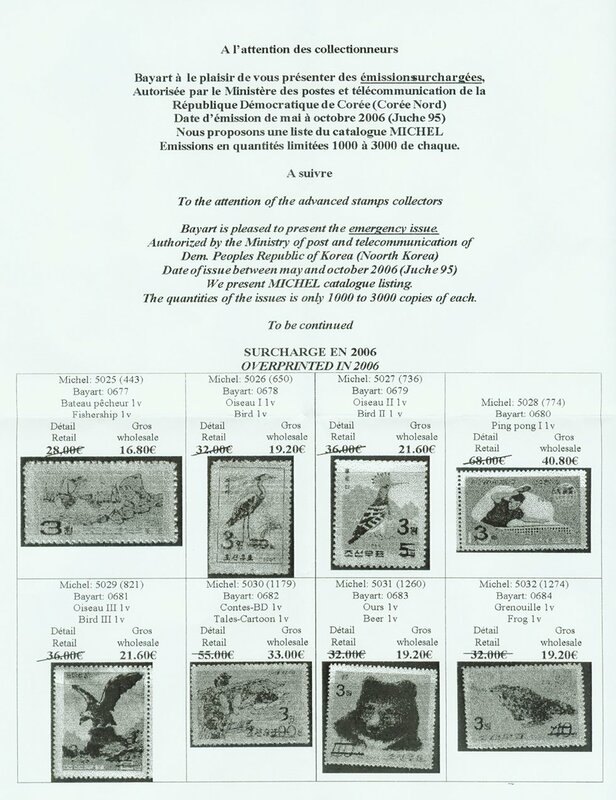 catalogue, page 272, between #4210 (July, 2002) and #4211(Sept., 2002), it states that “the DPR Korea changed the face value of stamps under a new postage order from August 1 in Juche 91 (2002). 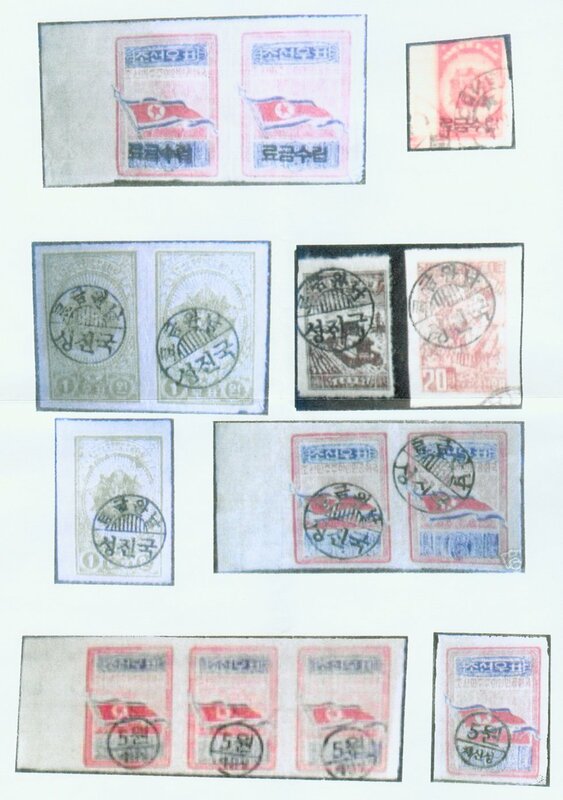 The Ministry of Post and Telecommunication of the DPRK took a measure that those previously issued 91 postage stamps were overprinted with the new denomination to be used for a certain period of time from August in Juche 91 (2002) according to the postage change.” They failed to designate which stamps (9l) were overprinted and their quantities. Overprinting types in most cases seem to be very similar, probably the same. Asking prices were EUR. 9.60 to 40.80, and, if everything was purchased, the total price was over EUR. 500. What a sum! And what is Michel’s listing standard when there is a discrepancy of issuing dates between the two descriptions? 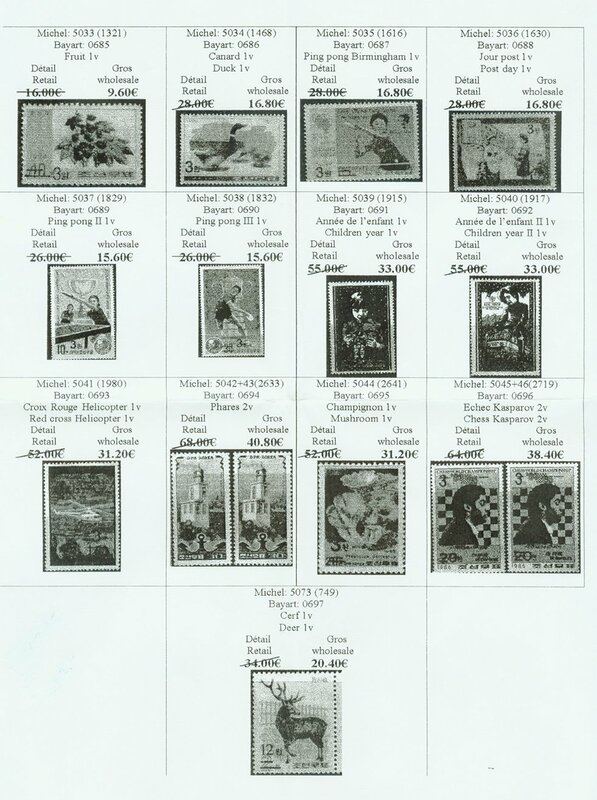 Considering that Michel gave definite catalogue numbers to these overprints, they should have direct and reliable information of these new issues supplied by N.K. authorities, I presume. Collectors deserve to have an opportunity to study such information in detail. Are these recent overprint stamps worth buying/collecting? It depends on what you mean by “worth collecting.” Throughout my collecting career that spans almost 70 years, I was always told, “Collect because you enjoy collecting and you enjoy what you are collecting. If you collect because you think you will make money, you are in the wrong hobby.” And that is SO true, as I now find that I need to dispose of my stamps because of increasing blindness. 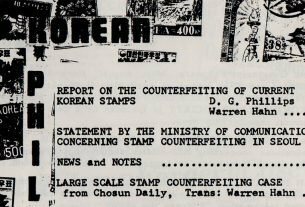 The stamps of North Korea have never been good investments, with the exception, perhaps, of the very early stamps and postal history. Hope this helps. I’d like to add some information about Group C overprint. 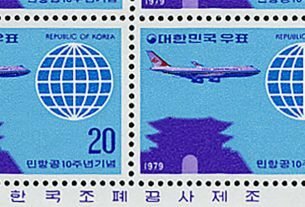 The stamp overprint with Son-Jin-Kuk, as mentioned by Dr. Maeda, “which was introduced and illustrated in N.K.’s own catalogue about a decade back for the first time”, was because Korean stamp corporation didn’t have that stamp already when they published the catalogue. So they borrowed the stamp from a local philatelist, used his stamp as a sample. And his stamp is overprint with Son-Jin-Kuk. Actually this is a rarer overprint, the more commonly seen overprint is pyong-yang-chong-ang-kuk. (Pyongyang Central office). And in each district(office), the type of the chop is different. Hello, can you introduce some North Korean stamp dealers? I need enough to buy North Korea (1958-1975) stamps. Are these recent overprint stamps worth more than the original stamps? The listed price is much higher than the original. I have the original stamp sheets (1963_A382_Sea Foods, 1965_A547_Gray Heron, 1994_A1487_DPRK Flag, 1998_A1724_Arch of Triumph, and 2000_A1785_Sun’s Day). I have not invested much but it is always good to know their value as a collector.